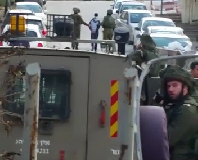 On the night of the 23rd to 24th of April, approximately 24 Israeli military vehicles entered the town of Burqa and arrested six Palestinian youths. 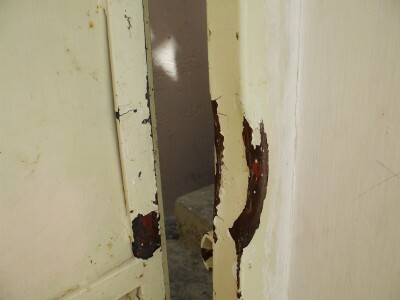 The Israeli army forced its way into five out of the six houses, using a device to break open the doors. 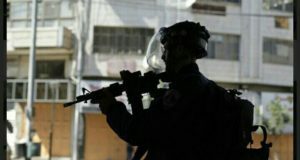 The army did not seem to know the exact location of one of the young men, and so broke into his uncle’s house, then the Israeli soldiers questioned a close friend of a youth to learn his exact whereabouts. The Israeli commander took this opportunity to threaten this Palestinian and told him to “watch out and don’t do anything wrong”. 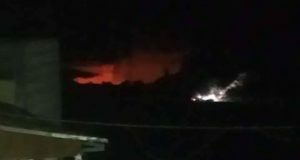 According to local witnesses, the Israeli army was seen surrounding the town of Burqa at midnight. Then, at 01:00AM, the series of arrests began lasting until 02:00AM, with the army going to six different houses and arresting a Palestinian youth in each one. All of the arrests followed the same pattern. The Israeli army broke the doors into the houses, except for one, and took a Palestinian in each home (ranging from 19 to 24 years old) spending just a few minutes in each of the houses. The arrested were handcuffed and blindfolded when taken outside of their homes or inside the military jeeps. No reasons were given to their families for the arrest and no questions were asked. Except for one of the families, they do not know where their sons have been taken; they are expecting a phone call from the Israeli army 48 hours after the arrest to know the whereabouts of their sons, brothers and nephews. The names of the arrested in Burqa are: Abd al Hakeem (19 years old), Amran (20 years old), Izat (20 years old), Mageed (21 years old), Bara Gehad (21 years old) and Ameen Tyseer Salah (23 or 24 years old). For all of them, except for Ameen on whom nobody could comment on in detail, it is the first time these youths have been arrested and in some cases, it is even the first time that one of their sons is arrested. Amran and Mageed physically resisted their arrest but to no avail. Relatives and friends of Barad know that he has been taken to Huwwara since they already received a phone call from the Israeli army. The other families do not know the whereabouts of their sons and may have to wait until Friday 25th to receive any information. Moreover the families do not know what charges their sons are being accused of and do not recall any major incidents in the local area that may go towards explaining this series of arrests. According to a local contact, four of them are active in the PFLP (Popular Front for the Liberation of Palestine) and two of them are active within Fatah. Burqa (Nablus) is a town located 18 kilometers northwest of Nablus, with a population of approximately 4,000 people. It overlooks Road 60, which is a road used by both Palestinians and settlers from nearby illegal settlements, vital to connect the northern area of the West Bank to major transport hubs like Nablus. This Israel army has previously harassed this town, the nearest illegal settlement is located five kilometers away (Shave Shomron). According to a local villager, 48 people from Burqa have been arrested this year; 38 of them belong to PFLP and the remaining 10 belong to Fatah.